Investigating Agatha Christie's Poirot: The old gang is back - photo released for 'The Big Four'! Thank you, ueetba!! :) Will update the blog post. This is great news. I always thought the series lacked something without Hastings & Japp. On a slightly different note, although you probably have them already being a HP fan, the BluRay releases of Seasons 1-12 are available from Amazon.es as a 2 for 1 offer until 2nd November 2013. Why the Spanish site? Well they seem cheaper than the UK equivalent (each box set being around 22€) and you can get the entire series for about 47€, which is a bargain in my opinion. The covers are in Spanish of course but the audio is also in English. I can't comment on the quality of the films themselves as I've only just ordered them but another user says that the colours and quality are amazing. Just thought I'd share - not spamming as I don't get anything from Amazon!. Thank you for that tip! Actually, I haven't bought the Blu-rays yet! I've been holding back for an ITV-released box set. But now it seems that box set will simply be a DVD release (for some uncomprehensible reason - why pay for the restoration process and then not release them in the best possible quality?). So I might go for the Spanish releases after all (particularly at the price you mentioned!). Ahhh the mysteries of the powers that be. 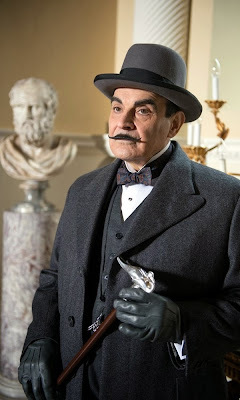 Maybe we should get Poirot on the case! Can't wait for the new episodes. Whilst I've got the attention of a true HP fan, I'd like to ask you why Hugh Fraiser wasn't in the later episodes? Is it because his character wasn't in the original stories or because he had other commitments? I always felt he added that touch of humour to the episodes that were very welcome, especially in the more darker stories. Why he wasn't in any episodes between "Murder in Mesopotamia" and "The Big Four", you mean? It certainly wasn't because of other commitments. As far as I know, it was a conscious decision by the Agatha Christie estate (and the TV series producers) around the time of the reboot in 2003-2004 that any future adaptations would be more 'true' to the books as written, which meant that Hastings (et al) wouldn't be added to stories that he/they didn't appear in. To compare, earlier episodes had been based partly on books and short stories that Hastings appeared in ("The ABC Murders", "Lord Edgware Dies", "Peril at End House" etc), and partly on stories that he didn't appear in. I understand the decision to keep him out in later years (to a certain extent!). They were going to adapt stories that were significantly darker than the short stories and the early novels, and to have Hastings (et al) added wouldn't really work. Personally I can't see what Hastings could have added to "Five Little Pigs", for instance. There's also the question of Poirot's character development. In the later novels, he laments the absence of Hastings and is described by George the valet at one point as 'a little depressed'. It's more in keeping with the books to emphasise this aspect of Poirot. Hastings did after all leave him behind when he left for Argentina. 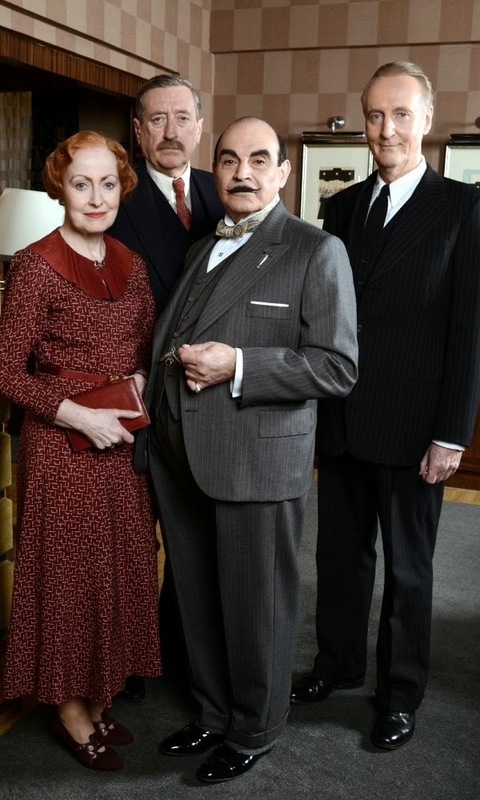 On the other hand, I do agree that the chemistry between Fraser (et al) and Suchet was absolutely delightful and a large part of the success of the early series. They are wonderful actors and it's absolutely right to bring them back for the final series. "Curtain" without Fraser would be outrageous, and it feels right to have them all back in "The Big Four". I'm just as delighted as everyone else! (By the way, since Miss Lemon doesn't actually appear in the novel version of "The Big Four", they have sort of broken their own rule, but then they have omitted her from later stories in which she did appear, so that seems fair). I have seen it commented other places -and now re-watching the series I agree - that the earlier, shorter episodes are very different in tone (lighter) compared to the later, longer ones, which are darker. The humor added by Hastings and Miss Lemon (the former, especially_ is certainly one reason, but it's more than that. Why do fans act as if Hastings, Miss Lemon and Japp were in all of the Christie novels? 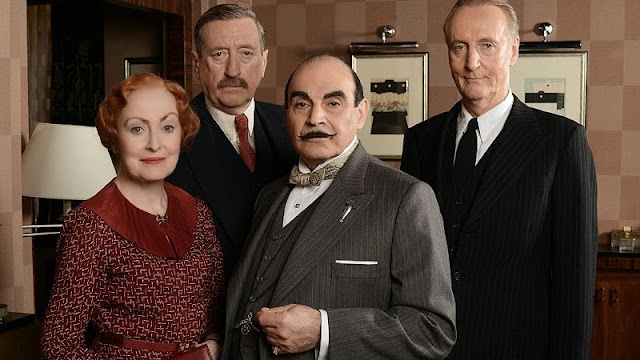 Some of Poirot's best stories did not feature any of these characters. And I've been enjoying Suchet's chemistry with Zoe Wanamaker over the past decade a lot. I didn't really miss the other three that much. And this production should have been set in either the late 1940s or early 1950s. The main characters - especially Miss Lemon, Hastings and Japp - looked too old for this story to be set in the 1930s.